Motor Run Capacitor 450VAC, 1uF, 85°C, with cable, CBB60 Run capacitor, voltage 450 VAC, 1 uF and operating temperature 85°C. Suitable for running mono-phase asynchronous engines, water and air pumps and other electrical devices. List Price 2.20лв. VAT Incl. 2.08лв. VAT Incl. Motor Run Capacitor 450VAC, 3uF, 85°C, with cable, CBB60 Run capacitor, voltage 450 VAC, 3 uF and operating temperature 85°C. Suitable for running mono-phase asynchronous engines, water and air pumps and other electrical devices. Motor Running Capacitor 450VAC, 1uF, 85°C, terminals 6.3x0.8mm, CBB60 Run capacitor, voltage 450VAC, 1uF and operating temperature 85°C. Suitable for running mono-phase asynchronous engines, water and air pumps and other electrical devices. Motor Run Capacitor 450VAC, 1.5µF, 65°C, with cable, CBB61 Motor run polypropylene capacitor, voltage 450 VAC, 1.5 µF and operating temperature 65°C. CBB61 motor capacitors are widely used and suitable for start up and running mono-phase asynchronous engines, industrial and home fans, washing mashines, industrial sewing machines, cooling pumps and compressors. List Price 1.99лв. VAT Incl. 1.88лв. VAT Incl. 1.79лв. VAT Incl. 1.68лв. VAT Incl. 1.59лв. VAT Incl. Motor Run Capacitor 450VAC, 2uF, 65°C, with cable, MKSP-8 Motor run polypropylene capacitor with voltage 450 VAC and capacity 2 uF. Motor Run Capacitor 450VAC, 3uF, 85°C, terminals 6.3x0.8mm, CBB60 Run capacitor, voltage 450 VAC, 3 uF and operating temperature 85°C. Suitable for running mono-phase asynchronous engines, water and air pumps and other electrical devices. 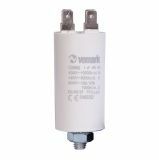 Capacitor motor run, 3µF, 400VAC, conductors, 85°C, 3000h Motor run polypropylene capacitor, voltage 400 VAC, 3 µF and operating temperature 85°C. 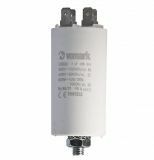 MKSP-8 motor capacitors are widely used and suitable for start up and running mono-phase asynchronous engines, industrial and home fans, washing mashines, industrial sewing machines, cooling pumps and compressors. Motor Run Capacitor 450VAC, 4uF, 85°C, terminals 6.3x0.8mm, CBB60 Run capacitor, voltage 450 VAC, 4 uF and operating temperature 85°C. Suitable for running mono-phase asynchronous engines, water and air pumps and other electrical devices. Motor Run Capacitor 450VAC, 4uF, 85°C, with cable, CBB60 Run capacitor, voltage 450 VAC, 4 uF and operating temperature 85°C. Suitable for running mono-phase asynchronous engines, water and air pumps and other electrical devices. List Price 4.90лв. VAT Incl. 4.66лв. VAT Incl. Motor Run Capacitor 450VAC, 5uF, 85°C, terminals 6.3x0.8mm, CBB60 Run capacitor, voltage 450 VAC, 5 uF and operating temperature 85°C. Suitable for running mono-phase asynchronous engines, water and air pumps and other electrical devices. Motor Run Capacitor 450VAC, 5uF, 85°C, with cable, CBB60 Run capacitor, voltage 450 VAC, 5 uF and operating temperature 85°C. Suitable for running mono-phase asynchronous engines, water and air pumps and other electrical devices. Motor Run Capacitor 450VAC, 6µF, 65°C, with cable, CBB61 Motor run polypropylene capacitor, voltage 450 VAC, 6 µF and operating temperature 65°C. CBB61 motor capacitors are widely used and suitable for start up and running mono-phase asynchronous engines, industrial and home fans, washing mashines, industrial sewing machines, cooling pumps and compressors. Motor Run Capacitor 450VAC, 6uF, 85°C, with cable, CBB60 Run capacitor, voltage 450 VAC, 6 uF and operating temperature 85°C. Suitable for running mono-phase asynchronous engines, water and air pumps and other electrical devices. List Price 2.90лв. VAT Incl. 2.76лв. VAT Incl. 2.61лв. VAT Incl. 2.47лв. VAT Incl. Motor Run Capacitor 450VAC, 8uF, 85°C, with cable, CBB60 Run capacitor, voltage 450 VAC, 8 uF and operating temperature 85°C. Suitable for running mono-phase asynchronous engines, water and air pumps and other electrical devices. Motor Run Capacitor 450VAC, 8uF, 85°C, terminals 6.3x0.8mm, CBB60 Run capacitor, voltage 450 VAC, 8 uF and operating temperature 85°C. Suitable for running mono-phase asynchronous engines, water and air pumps and other electrical devices. List Price 2.80лв. VAT Incl. 2.65лв. VAT Incl. 2.51лв. VAT Incl. 2.38лв. VAT Incl. Motor Run Capacitor 450VAC, 10uF, 85°C, terminals 6.3x0.8mm, CBB60 Run capacitor, voltage 450 VAC, 10 uF and operating temperature 85°C. Suitable for running mono-phase asynchronous engines, water and air pumps and other. Motor Run Capacitor 450VAC, 10uF, 85°C, with cable, CBB60 Run capacitor, voltage 450 VAC, 10 uF and operating temperature 85°C. Suitable for running mono-phase asynchronous engines, water and air pumps and other electrical devices. Motor Run Capacitor 450VAC, 12uF, 85°C, terminals 6.3x0.8mm, CBB60 Run capacitor, voltage 450 VAC, 12 uF and operating temperature 85°C. Suitable for running mono-phase asynchronous engines, water and air pumps and other. Motor Run Capacitor 450VAC, 14uF, 85°C, terminals 6.3x0.8mm, CBB60 Run capacitor, voltage 450 VAC, 14 uF and operating temperature 85°C. Suitable for running mono-phase asynchronous engines, water and air pumps and other. Motor Run Capacitor 450VAC, 16uF, 85°C, with cable, CBB60 Motor capacitor, voltage 450 VAC, 16 uF and operating temperature 85°C. Suitable for running mono-phase asynchronous engines, water and air pumps and other electrical devices. Motor run capacitors are capacitors that are plugged in the chain throughout the workflow of the electric motor. They compensates the drops in the electromagnetic field in the rotor windings. 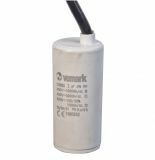 Use of an inappropriate capacitor can cause a malfunction in the engine and even to its overheating and damage. Running capacitor CBB61 series are widely used and are suitable for initiating and management of single-phase induction motors, different types of industrial and domestic fans and ventilation systems, washing machines, industrial sewing machines, pumps and refrigeration compressors. Running capacitor CBB60 series are widely used and are suitable for starting up and management of single-phase induction motors, industrial and domestic pumps, air compressors and more. Vikiwat Ltd. is a direct importer of a wide range of working and other types of capacitors and offers discounts when buying larger quantities. Our technical consultants are available when you need advice both in our store located in city of Plovdiv,Bulgaria and on the phone when shopping online. Welcome to visit us or shop in our virtual store for the latest offers and models.